Job Creators Network, a conservative outside group that works with small business owners and leaders, held a rally in D.C. today as part of their multi-million dollar tax campaign. 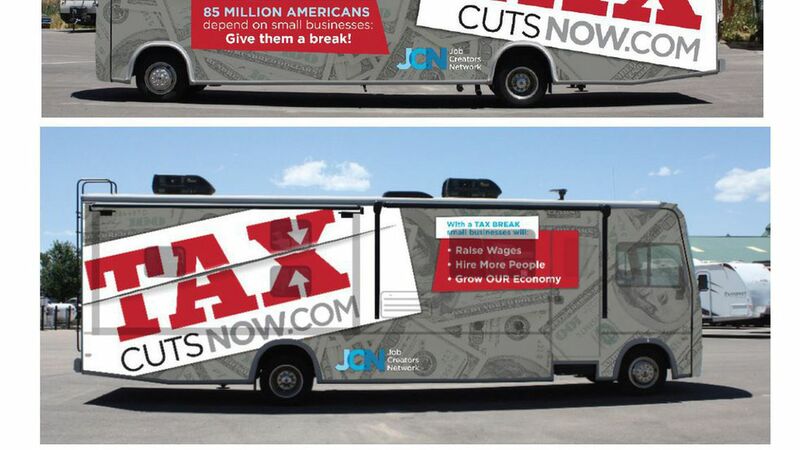 The organization hosted this bus tour and rally to advocate for "the immediate need for tax cuts" for small businesses, said JCN President Alfredo Ortiz. The most surprising thing for Ortiz is why tax cuts for small businesses hasn't been a main conversation before now. A 15% corporate tax rate is the goal, but as administration officials like Gary Cohn say it's mathematically impossible, Ortiz says anything is better than the current rate and small business owners hope the admin will bring it down as low as possible. Small business owners want tax cuts, and they're OK with tax reform not happening this year. "Tax cuts are the way to go" because they would allow small business owners to start planning for 2018, Ortiz says. They're optimistic about Trump's ability to deliver on tax cuts by the end of the year. Dina Rubio, who runs a Cuban restaurant in Florida, said she's already planning to hire 6 to 8 more employees, and has mapped out where to install new high-top tables in her restaurant. "Somebody is thinking about us," Rubio said of Job Creators Network and their push to raise awareness about small business tax cuts. Joseph Semprevivo, who owns a cookie shop in Florida and New Mexico, said Trump, "who has signed the front of checks and employed tens of thousands of people gets what a tax cut means for businesses." They want Congress to give Trump a tax cut plan by Thanksgiving. If not then, Ortiz says by the end of the calendar year. Reality check: So far, the administration's tax reform plan has lacked crucial details that would suggest a complete reform of the tax code is happening. Instead, talking points from the administration to small business leaders and others on Capitol Hill suggest they are planning to focus on tax cuts: they frame cuts and fairness, highlighting a reduced tax for the middle class and arguing for "corporate tax cuts as fairness for small businesses to level the playing field for American workers."